I have a ton of page protectors - not scrapbooking ones. The ones I'm referring to are for 8 1/2" x 11" papers and are the non-glare type. I used to use them in notebooks holding magazine clippings, home show photos and photos of my own projects to share with clients in the early days of my window treatment business. In the last few years of my business, I stopped hauling around those heavy notebooks and used my laptop. Those notebooks were invaluable for a long time, now they just gather dust. So I've been breaking down a few at a time and I hate to throw away perfectly good page protectors. I also have a problem storing die cuts so the two needs have met in this project. 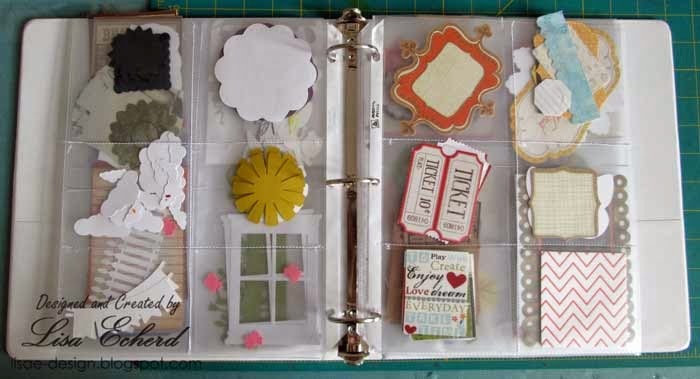 The video shares how to created the little pockets from a page protector. You could do the same with a scrapbooking page protector as well. You do need a sewing machine for this project. Other than that, a Sharpie, ruler and good scissors will do it. Isn't it rewarding to find new uses for old things? Thanks for stopping by! I'm off to a crop this weekend! I'm so excited to put some faces to screen ids. This is such a great idea, Lisa! I have plenty of those page protectors on hand. Thank you! Brilliant!!!! I am definitely going to be doing this. Thank you! Thank you!